An adorable new film is coming to DVD for your little ones! Ready, Set, Sled! 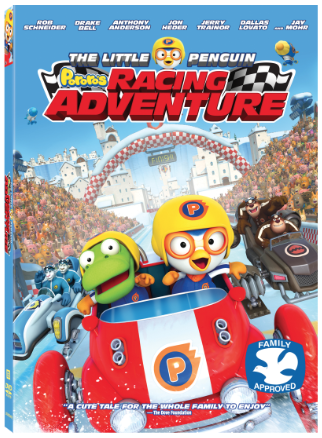 Just in time for the 2014 Winter Olympics, the engaging and entertaining family film The Little Penguin: Pororo's Racing Adventure arrives on DVD and Digital, exclusively at Walmart, February 4th from Lionsgate Home Entertainment. Watch as Pororo's dreams come true when he participates in the ultimate Super Sled race with his friends. Awarded the Dove Seal of Approval, this fun-filled adventure features an exceptional cast of voice talent including Rob Schneider (Grown Ups), Drake Bell (TV's "Drake & Josh"), Anthony Anderson (TV's "Guys with Kids"), Jon Heder (Napoleon Dynamite), Jerry Trainor (TV's "T.U.F.F. Puppy") and Jay Mohr (Are We There Yet? ).